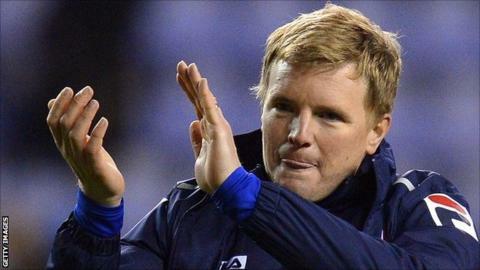 Bournemouth boss Eddie Howe has admitted he is wary of the pressure of chasing promotion affecting his squad. The Cherries topped League One last weekend, but were leapfrogged by Swindon after their defeat by Preston. Howe, who returned to the club last October, wants to turn the chase for promotion into an uplifting experience. "We want to try and make that a positive pressure that we enjoy rather than being a negative round our neck," Howe told BBC Radio Solent. The Cherries have only lost twice in 22 league games, but have tough matches coming up against Sheffield United, Coventry, Leyton Orient and Doncaster. "It will be a big test, we have some tough games coming up and a tough run," he said. "If we can come through these fixtures well then we'll be in a good position. "Every team between now and the end of the season will have wobbles as there is still a lot of games to go. No-one is going to win every game. "It's about keeping your wobble to a minimum while keeping your good patch going as long as you can. We lost last week, we want to bounce back with a win." Swindon currently lead on goal difference, with Bournemouth and Doncaster on the same number of points. Sheffield United and Yeovil are just a point behind, while Tranmere occupy the final play-off position a point further back. "You look how tight it is at the top and how many of the teams are challenging for six positions and there is a lot of pressure on every team," added Howe. "It's quite unusual to have any team from six (being in contention). It's not easy and it's tight for a reason. It's a key time of the season, but a great time to be a Bournemouth fan."